Squirrels LLC, the makers of Reflector and Air Parrot launched Slingshot on May 1st. Slingshot is an application allowing iOS screen sharing to anywhere in the world. Slingshot is a service-based application that allows users to connect with others and share their device screen, files, and ideas with others around the globe. “Slingshot is revolutionary,” Squirrels president David Stanfill said. “We really think it’s going to change the online meeting and collaboration game. “Sharing is no longer limited to the same room or building. It can happen from anywhere,” Stanfill continued. Slingshot will allow users to share their iPad, iPhone, and iPod screens to anyone else in a Slingshot session. Mac and PC screens can also be shared and viewed by anyone in a session. While the mobile screen sharing is what makes Slingshot stand apart from it’s competitor, it includes online collaboration and meeting tools, too. Meeting Minutes allows anyone in a session to take collaborative notes in real time, and instant file sharing shares files with everyone in a session regardless of the device they’re using. Video, audio, and text chat are available across all devices, too. Multiple monthly plan subscriptions are available but users can first try Slingshot free for 30 days. 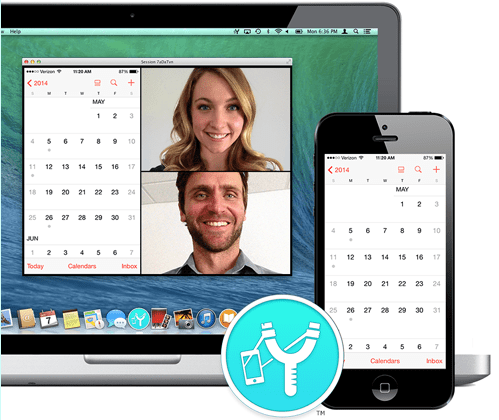 The individual plan allows one-on-one collaboration and screen sharing for $9.99. Other plans are available that allow more users, more webcam feeds, dial-in access and more concurrent sessions. Special pricing and plans are available for corporations and larger groups with unique needs. Slingshot has a number of potential uses. Anyone currently using software to meet online will be interested in Slingshot. The application makes remote training and support easier, especially those trying to showcase or support mobile applications. Any teams collaborating remotely will find Slingshot helpful. Slingshot can be found at http://slingshotapp.com. Mobile and tablet users can find Slingshot in their respective device app stores. By aware: Many corporate and educational networks are split into segments called subnets. For iOS Screen Sharing to work properly, Slingshot must run on a computer in the same subnet as the desired connecting device. Bonjour and mDNS multicast traffic must also be enabled.